Above: HSBC Strategist David Bloom. Image (C) Bloomberg, Pound Sterling Live. Analysts at HSBC upgrade their Pound Sterling forecast but commentators say analysts at the high-street giant are "chasing their own tail" on their forecasts. 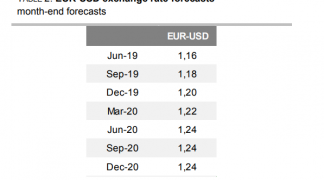 HSBC Bank plc have upgraded their forecast for the British Pound, and in doing so ackowledge the UK currency is unlikely to fall to 1.0 against the Euro. HSBC's forecast for Sterling-Euro to fall to parity in late 2017 has made the bank the most pessimistic in the institutional community where the median forecast is 1.12 for year-end 2017. Analysts at the bank have focussed on the UK's deficit in global trade - where imports exceed exports - as being the currency's central liability. But Sterling appears to be unwilling to yield lower levels with recent guidance coming out of the Bank of England aiding the currency’s recovery to a 15-month high against the Dollar and multi-week high against the Euro. What appears to have caught Bloom and his team surprise is Sterling's unwillingness to be swayed by Brexit fears. "The idea of heightened political uncertainty, difficult Brexit negotiations, or persistent trade deficits – is now playing second fiddle to the possibility of a cyclical rate rise," says Bloom. Instead, the currency has been swept up in the global race to “normalise” central bank policy with the Bank of England keen not to be left behind by the US Federal Reserve and European Central Bank. And on this count, direction has taken a pro-GBP turn with the Bank hinting at a November rate rise. Above: Brexit fears are not what counts for the Pound. Rather, it is policy differences between the US Fed and Bank of England. HSBC’s mea culpa on Sterling is not unique, last week we reported MUFG berated themselves for downgrading their forecasts on the Pound in the wake of the Bank of England’s August Inflation Report. MUFG have told clients they are reverting back to these original forecasts acknowledging the downgrade issued in August was a misjudgement. MUFG now forecast Sterling to rise into the 1.40s against the Dollar and the 1.17s against the Euro. Despite the upgrade, HSBC are not convinced the Pound is due a recovery anytime soon. Indeed, 2018 is likely to still see notable weakness in the Pound suggesting current levels are something of a sweet-spot. "Over time, politics will become front and centre again – but as it would seem not in 2017," adds Bloom. The Pound-to-Euro exchange rate is now forecast at 1.12 by end-2017, up from 1.0 previously. 1.11 is seen by the end of the first-quarter 2018, 1.09 by mid-2018 and 1.05 by year-end 2018. The previous forecast for all the above timeframes was 1.0. The Pound-to-Dollar exchange rate is forecast at 1.35 by year-end 2017, up from 1.20 previously. It is seen at 1.33 by the end of the first-quarter 2018, 1.31 by mid-2018 and 1.26 by year-end 2018. All previous forecasts were for 1.20.